As I looked at the sink filled with dishes, I wondered what horror awaited me when I opened our dishwasher. The sink was pilled high with knives, forks, plates, and glasses. There were even a few pots and pans in there. It was disgusting. With great trepidation, I opened our dishwasher, prepared to see things that would make me question all that was good and holy. Instead I saw...barely anything. Except a knive with lots of peanut butter and jelly on it and one of those McDonalds disposable extra large cups that we sometimes keep using permanently. "Joe," I called to my best friend and roomate, "there are no dishes in the dishwasher, but the sink is full of them." "I know man, I'm sorry," he repiled. "It's something my dad did and I think I inherited it. I'll try to make sure from now on..."
"No, it's okay Joe. I do the same thing..."
And it's true. 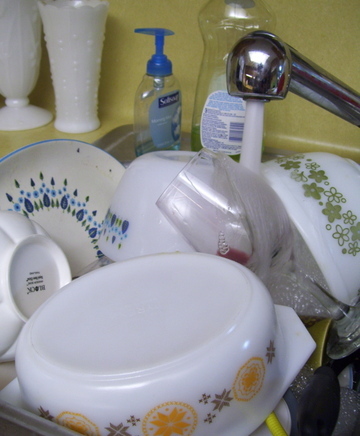 Seriously guys, why do we just put dishes in the sink or on the counter instead of in the dishwasher. Lord knows my mom tried to train me to do this. Of all the many daily lessons of cleanliness and decency that she tried to instill in me from a young age, the sound of her voice saying "Nicholas! Dishes in the dishwasher!" rings through my ears like a hawk screaming as it dives towards a fleeing chipmunk. Now I think I've ended up being a fairly tidy person compared to many of my mid 20's counterparts, but this task of putting dirty dishes where they are supposed to go still eludes me. And when I do put my dishes in the dishwasher, I feel as though I have completed some sort of heroic trial and risen to a place of prominence within the fabric of our society. There was even a Klondike Bar commercial that made fun of this symptom in males. It's almost as though it is hard wired into my being to not want to complete this simple task. So over the past few days I have tried to make an extra effort to put my dishes in the dishwasher right after I use them and not let them collect in the sink. In this new daily taks I feel as though I am being flogged by the whip that is life. I'm definitely not lazy--I'll stay at school till midnight to get work done, put in time at the gym, and hang up my clothes. But this dishes in the dishwasher thing is just a bizarre mantrait that I suppose I will need to lear to shake. Nick Catalano says that he has no idea what I am talking about with this, but Nick probably lacks a lot of main traits, some of which I won't mention here out of respect and sympathy. But how many of you are with me on this one? I would love to type longer, but I think I might get something to drink out of the fridge...which invariably means using a glass...which invariably means that tonight, I will look evil dead in the eye...and set it to heavy with auto dry.